OVG Real Estate, the Dutch commercial real estate developer and investor, has created the world’s most sustainable office building after its newest property was awarded the highest score ever recorded by the Building Research Establishment (BRE), the global assessor of sustainable buildings. The Edge, located in Amsterdam, the Netherlands, achieved a BREEAM new construction certification of ‘Outstanding’. OVG worked in close partnership with the building’s principle occupier, leading global professional services firm Deloitte and AKD, notary and lawyer firm. The Edge is a multi-tenant office building that is far ahead of its time in terms of quality, sustainability and user comfort. The building has a transparent layout with floors over 2.300 sq.m. LFA per floor. These enormous floor areas are laid out in a U-shape around the majestic atrium in order to stimulate communication and to contribute to creating as many natural meeting points. 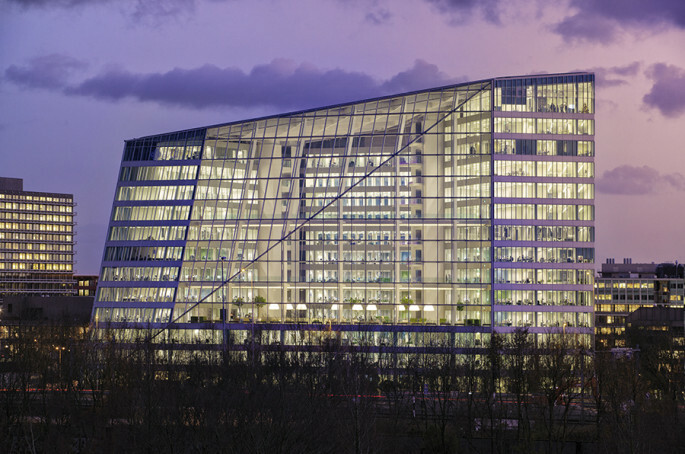 Located just along the A10 highway, The Edge serves as an impressive gateway to the Amsterdam Zuidas business district. A real feat of modern engineering and sustainable development, this innovative building, with its large glass exterior, is a beacon of light, design and sustainability. The building is designed according to the principles of ‘The New World of Work’ with large floor plans and plenty of open workspace that allow for open and clear communication. The majestic atrium is surrounded by balconies and staircases turning it into a real meeting place where employees can easily reach different floor levels. With its excellent transportation links, the close proximity of Schiphol Airport, the presence of a university campus and a favorable international business climate, Amsterdam Zuidas is fast becoming one of Europe’s most significant business and knowledge districts. The Edge was the first building to utilise Philips’ Ethernet-powered LED connected lighting, which enables employees to use an application on their smartphones to regulate the climate and light over their individual workspaces. This innovative technology not only saves businesses money on energy costs, but serves as a means of providing information and data about how the building is running to drive overall efficiency. The building is also energy neutral. To achieve this, OVG partnered with the University of Amsterdam (UvA) and the Amsterdam University of Applied Sciences (HvA) to fit an area of 4,100 square metres (44,132 sq ft) on the school’s rooftops with solar panels. The south façade of The Edge is also fitted with solar panels on all surfaces that are not windows. Furthermore, an aquifer thermal energy storage (approximately 130 m. below the ground) generates all energy required for heating and cooling of the building.